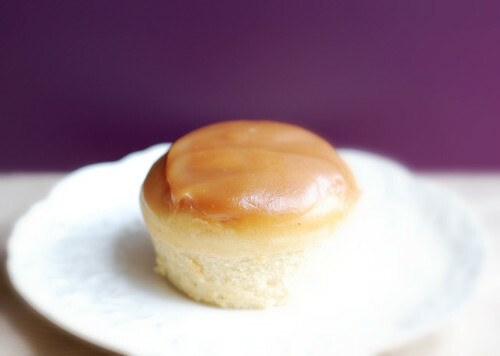 Soft white cupcakes stuffed with grape jelly, topped with peanut butter glaze. Preheat oven to 350 degrees F. Line a 12-cup muffin tin with liners. In a medium sized mixing bowl, sift together flour, baking powder and salt. In a large mixing bowl, using a mixer on medium speed, beat together butter, peanut butter and brown sugar, until creamy, about 1 minute. Beat in eggs and vanilla until combined; reduce mixer speed to low and beat in flour mixture until just combined, alternating with milk. Divide about 1/3 of the batter into muffin tin. Place a teaspoon of grape jelly into the center of each cup; evenly top with remaining cake batter. Bake for 17-20 minutes or until well risen and golden. Cool 10 minutes on a wire rack before running a knife around outer edges and inverting out. Cool completely on wire racks. To make the peanut butter glaze, whisk together heavy cream and brown sugar, in a small saucepan, over medium heat, and bring to a simmer; remove pan from heat and whisk in peanut butter until combined. Cool mixture for a few minutes until a good consistency is reached to dip the cupcakes in. Dip tops of cupcakes into peanut butter glaze and allow to dry. Double dip for double the pleasure. 44 comments on "Peanut Butter & Jelly Cupcakes"
Oh the cupcakes look yummy! I don't know any of these cakes but from the looks I would probably go for star crunch!! i think i liked those pb bars and oatmeal creme pies... but i'll take these little gems any day :) i just tried the pb&j larabar, it was pretty tasty! My absoulte fav were those oatmeal creme pies. Oh my goodness I could eat a box of those afterschool. But now I'm just like you, I have to avoid that stuff. I know I won't be the only one excited about this recipe! Mmm... if I can't figure out what I want to eat for lunch, a PB&J sandwich never fails me. These cupcakes look soo good, I will definitely be trying these! your little cakelets look sooo soft and delicious--i highly doubt little debbie could replicate such a delight. my favorites are the nutty bars, but the oatmeal creme pies are a close second. i'd never even heard of some of those, though; i'm going to have to check them out! I'm loving your pb&j treats! Star crunch?! I haven't had one of those in years. Those and the Nutty Bars are the best. These cupcakes look so great. I want one now! I'll take a pass on the Little Debbie's but want one or two of your cupcakes. They look wonderful! Just need a big icy cold glass of milk to chug along with them. That glaze looks like it's to die for! I am definitely using raspberry jam in place of the jelly. Is that okay? Are you saying that you (poor thing) were deprived of Yodels and that you only had Swiss Cake Rolls? That's sad, really sad. AND you never mentioned those individual cherry (or apple) pie things. OMG, those were (ARE!) good. 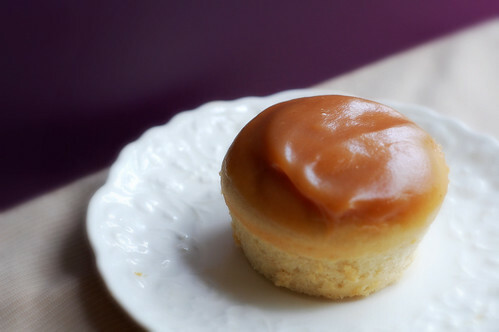 The peanut butter glaze sounds great, and the texture of the cupcakes is even better. Star Crunch is my favorite. I like the caramely-chocolatey-rice krispie texture. I whole-heartedly agree that there needs to be more PB&J recipes out there. I love my PB&J sandwich cookies, which I make on a fairly regular basis but there need to be added to that list asap! I absolutely love the sound of this recipe and CANNOT wait to try it! Thankfully, I just restocked my PB supply! Would you believe I've never had any Little Debbie cakes? I'm not sure why. I remember growing up the big packaged snack cakes were Hostess, Drakes, and, depending on where you were, Tastykakes. I just don't remember Little Debbie cakes growing up. I think I first remember seeing them in supermarkets and convenience stores in high school or college, and by then I was sort of over the snack cake thing. It's all about that artificial ingredient stuff you mentioned. I figured I could make better desserts. I know you can make better desserts. Your cupcakes would be way better than anything Little Debbie would make. I've never even heard of Little Debbie. Sometime I wonder if we're from different planets. Just different countries, I guess. Have you ever heard of a Joe Louis? Sweet cupcakes- love the glossy tops. Okay, I'm pretty sure I could eat ANYTHING if it had that peanut butter glaze on it! nothing can ever go wrong with pb & j! Ohhh yummmm. I will definitly make these. I once made PB and J muffins and they were divine. I'd have to agree on the Nutty Bars being the best. Theres just no substitute. And taking them apart and licking out the PB is def the best way to eat them! Oatmeal Creme Pies win, hands down, but man your cupcakes look gooooood. 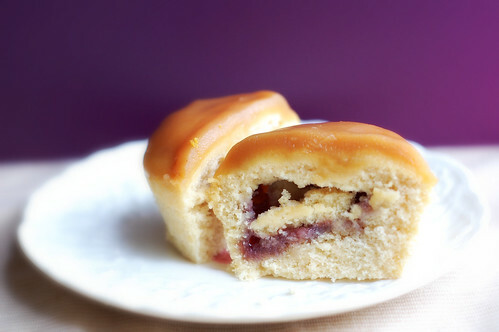 These look good - I recently came up with a version of PB & J Cupcakes too. You might like them as well. How good! That looks so delicious! These are adorable! Who knew pb&j could be so versatile? Ok, ok - I admit - I just ate a Nutty Bar yesterday! Love them! But these cupcakes look even better. These look ridiculously good. Thanks for reminding me about Little Debbie...I need a star crunch now! I'm making these ones. They're just too cute! Definitely nutty bars in my book too! I LOVED them growing up. These cupcakes look super yummy, and different from the run of the mill usual cake and frosting. I'm not a pb&j fan, but your cupcakes are really cute! It so cool how you can see the different layers instead of everything sinking to the bottom. The "NUTTY BAR" is by far and away the best snack of all time!! 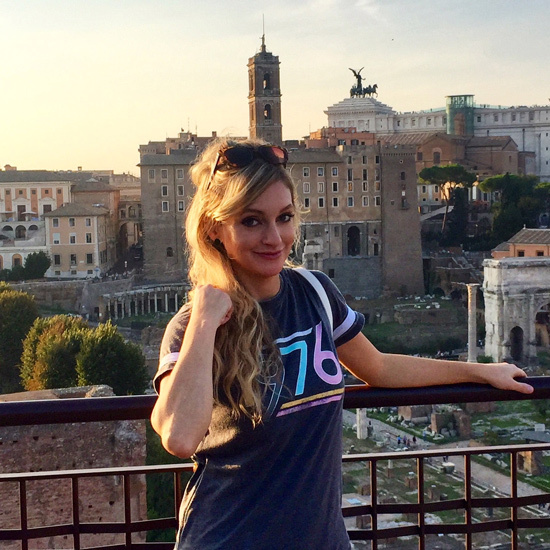 Very cute my dear, you are in the nostalgic mood aren't you! I can't pick between Oatmeal Creme Pies & Nutty Bars. Equally awesome. These are so cute! I don't know why, but they look like they should have a little smile or something. This recipe's gonna become a quick classic. I am definitely a nutty bar fan! This cupcakes look really yummy! You should market your idea and your recipes and make a fortune. I grew up on cream cheese and jelly. I wonder if I am the only one in the world. Veeeeeeeeeeery cool. I am trying this absolutely for sure. Staff at work will LOVE LOVE LOVE these! I don't think we have Little Debbie in the Pacific Northwest but even if we did, I'm sure I would prefer your version! Those look terrific! wow - that glaze is amazing!!! loved these!! Ahhh I am soo drooling! !